I’ve been spring cleaning and I am at my wits end. The carpet in my son’s playroom is bad. Just awful. He had a sleepover last week and they spilled fruit punch. Now this isn’t the first spill this carpet has seen… not by a long shot, but they were so busy playing and my son didn’t know it happened, so it was left all night without being cleaned up. Ugh. I know it’s a playroom, but I can’t stand to go by this room every day and see this stain. It’s like it’s the only thing I see in this room. I cleaned and cleaned the carpet, but can’t get it clean. I’m afraid that part of the problem is I want to clean it using green products. So I’m in need of some Green Choice Carpet expert carpet cleaning. Someone who can not only get the carpet clean, but use eco-friendly cleaning products to do it. I’ve been more conscious of the cleaners I’m using… you know Earth Day is April 22, so I want to practice what I preach. I want to add that my son was so apologetic about it and he did help me try and remove the stain. And we did get the vast majority of it up, after about 3 days of cleaning. As my son says, “Accidents happen, Mom.” Indeed they do, my son. Out of all my spring cleaning tasks, carpet cleaning is probably the most important to me… it’s also the last thing on my spring cleaning list. Once I have the carpets clean, I know I’m done, but most importantly I know my house is really clean. What is the most important spring cleaning task on your to-do list? Oh man I hate when something spills on the carpet. So hard to get clean. Ugh. I loathe carpet spills. Actually, I loathe carpet. I prefer hardwood floors. Yeah — not a fan of carpet spills. My big project this year is closet organization … definitely need to get it! We are getting carpet again and I am not that happy about it. I hate how dirty carpets can get, so I finally ripped ours out and put in hardwood floors. We recently moved, so my biggest spring cleaning task is unpacking all our boxes and getting everything organized. That carpet looks a lot like mine! I have a Rug Doctor that would probably get that out! We have a silly putty stain that will NOT come out. 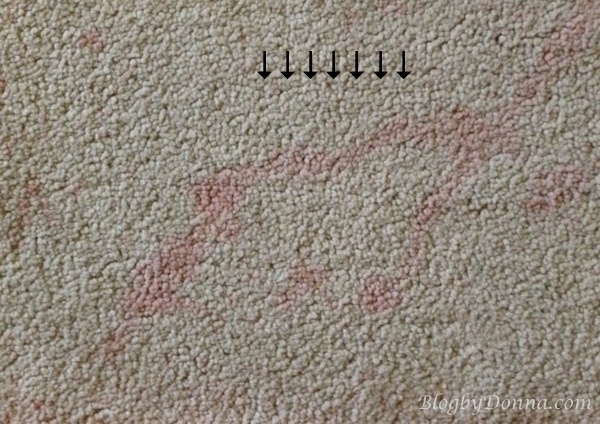 We plucked most of the putty up but the dyes in it stained the carpet. Drives me crazy. We’ll be moving this year yet so my biggest spring cleaning chore is purging. I just got a hand held carpet spot cleaner. Hopefully if we have spills like that in the future I’ll be able to clean it up right away and avoid having the professionals come out! That red dye is the worst!!!! I hope it comes out easily! I would get rid of that carpet all together and get like an indoor-outdoor or even berber carpeting for a playroom!! Good luck!! I just need to clean! Mine is just cleaning out the house in general.